The Bracken Arms hotel was located on the east side of Government Road, near the Brackendale General Store. A fire destroyed the building in 1914, but the chimney and fireplace still stand today. Chief Long George, who lived around the turn of the century, always won top prize at John Bracken's turkey shoots. 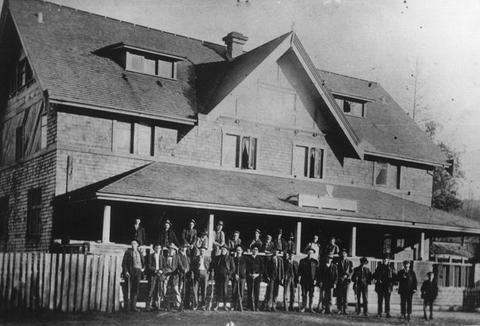 Back row, left to right: ?, Charlie McKinnon, Fred Downer, ?, Wilfred Rae, ?, Earl Parkest, Lance Bracken (architect who designed this hotel). Front row, left to right: Mr Hickey, Bert Rae, Albert Edwards, ?, Bob Hutchinson, Charlie Clerk, Hughie Mills, Al Armstrong, Chief Long George, Fred Thorne, Tom Brett, Billy Mallett, Mr Blodgett. Those thought to be in the picture but their positions unknown: Cliff Thorne, Bert Perkins, Harry Judd, Jack Edwards, Wilbie Judd, Fred Magee, John Bracken, Jack Habricht, Charlie Fairman, Jack Greer, and Ralph Brereton.